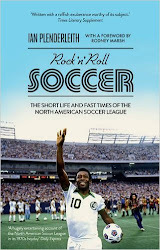 ROCK N ROLL SOCCER: "Well worth your hard-earned buck"
"Plenderleith’s superbly researched, fact-packed book sets out not only to recap the excesses we know about [the NASL], but also to remind us and celebrate that, with so many of its innovations it was ahead of its time. There was so much more to the NASL than cheerleaders, fireworks and razzmattaz – but in the good old US of A, there’s no reason you can’t throw them in for good measure! "But you’ll also find out a lot of stuff from the periphery and the far-flung outposts of the NASL that you may never have known without reading this book. The league wasn’t just about the New York Cosmos, you know! "Plenderleith also pokes around the murky world of the moneymen and politicians of the NASL and how, eventually, those in charge really didn’t have the first idea how to run a soccer club or a league (the Jimmy Hill chapter was an eye opener for me). "As well as being an engrossing eulogy to the madness and magic of [the] NASL, there’s a healthy smattering of entertaining facts and stats intertwined between chapters. This book is highly recommended whether or not you’re an aficionado of NASL or MLS. This cautionary tale is part of our game’s weird and wonderful history and one that is too often shrugged off with snobbish disdain by European observers as a mere far-away, inconsequential circus. Once you read this book, you’re likely to have changed your mind. The NASL’s legacy may be more visible than you think."